The Onion Ditch Bridge in Logan County, Ohio is officially the longest recycled plastic bridge in the United States. The sturdy 24.6-foot-long bridge was constructed with AXION’s proprietary ECOTRAX and STRUXURE materials comprised of 80 percent post consumer plastic (such as lotion and detergent bottles), and 20 percent recycled car bumpers and dashboards. 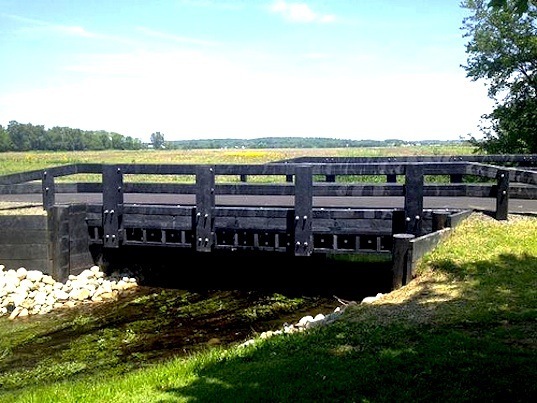 Impervious to insect infestations and exceptionally durable, the 100 percent recycled bridge is made of materials that will not absorb moisture or rot. The anticipated 50 year life span combined with the earth-friendly materials contributed to the county’s decision to contract AXION, according to engineer Scott Coleman, who added that the county has plans to achieve zero waste by 2020. 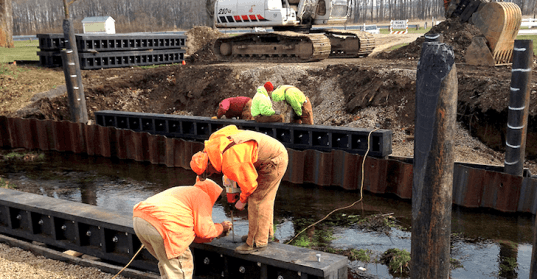 The largest recycled plastic bridge in the United States, the Onion Ditch Bridge was built on a public road and 80 percent funded by the Federal Innovative Bridge Research and Deployment Program tasked with improving bridges across the United States. A further 17 billion investment is required to bring existing bridges back up to speed, according to a 2009 report published by the American Society of Civil Engineers. The Onion Ditch Bridge in Logan County, Ohio is officially the longest recycled plastic bridge in the United States. The sturdy 24.6-foot-long bridge was constructed with AXION's proprietary ECOTRAX and STRUXURE materials comprised of 80 percent post consumer plastic (such as lotion and detergent bottles), and 20 percent recycled car bumpers and dashboards.